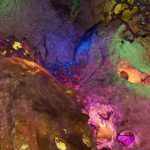 Karst is a liminal space in between the representational and the theatrical, the limited and the multi-dimensional, and the abstract and the real all meeting together. Inspired from Fu’s childhood experience visiting the caves from her hometown in Southwest China. The memories and the impact of the experience is still quite vivid. 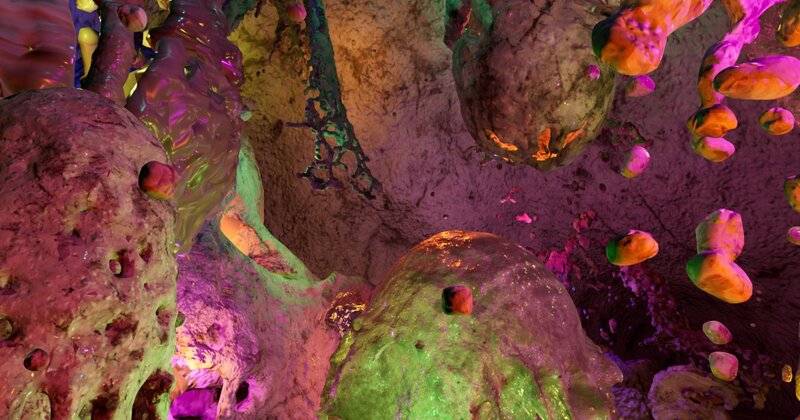 The space felt both extremely claustrophobic and large, and this aspect would be evident especially when the viewers are experiencing the piece within the VR Headset, as the ceiling of the cave is about 60 feet high (something you will definitely experience less in this recorded video). 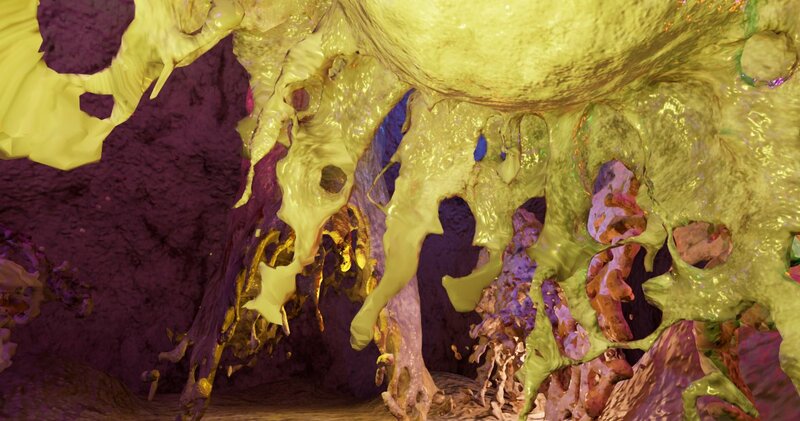 The rock shapes in the virtual scene are made with fluid simulation software Realflow, as water was naturally playing a large role in sculpting out the physical shapes of the caves, as well as making the calcium accumulation inside for thousands and thousands of years. 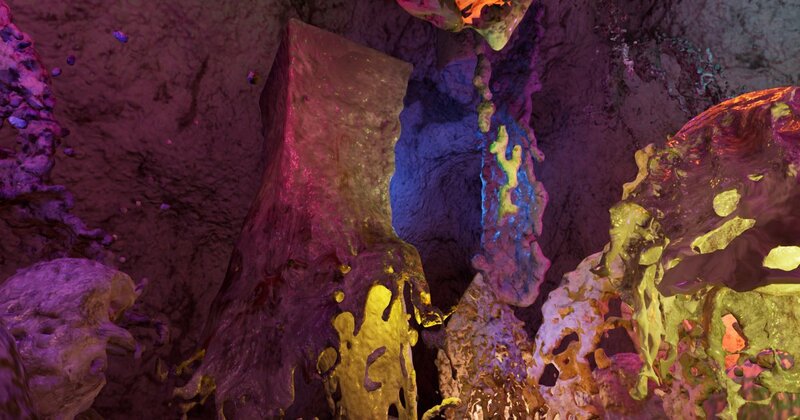 The original display of the cave space that the piece is representing already has its own complexity with both strong aspects of the natural formation and human involvement. 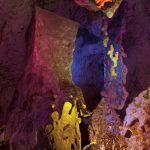 In one hand, the Karst caves are a display of long period of time all in one setting. The formation of the rocks took much longer than any average civilization let alone human’s lifespan. 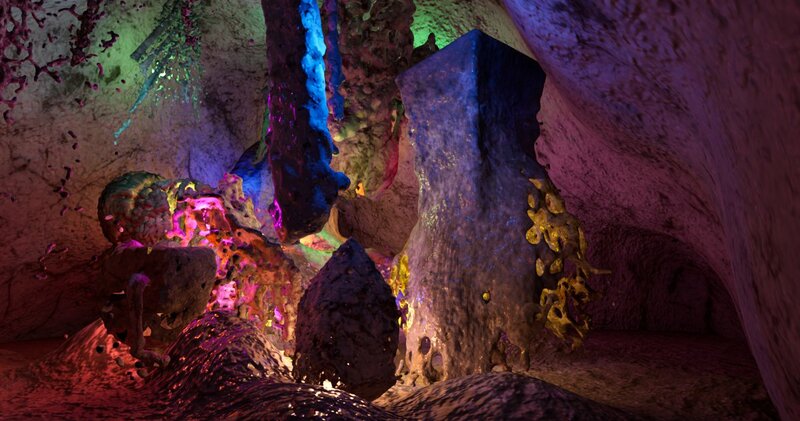 In the other hand, the caves are often lit up by the highly artificial and saturated decorative lights. A decision made by the tourist department for groups of explorers to see better the breathtaking rock forms. 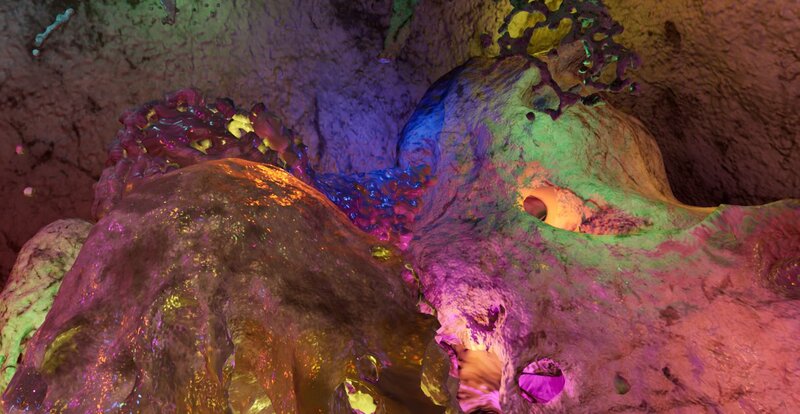 In recent years, according to more research done on the conditions of the Karst caves, some of them are being utilized by the Chinese government to host the ever growing big data hardware due to its controlled environment and many other safety factors. 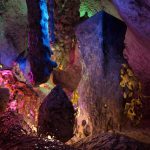 While more and more personal data are being stored by national scaled arrangements right inside of the mountains of Fu’s hometown, she felt that it is time to recreate her strong childhood memories of the caves. 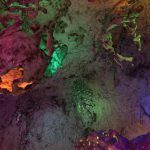 She recreated the cave in a digital VR space for more people to explore and to bring attention into the multi-layered digital nature of our contemporary human life. 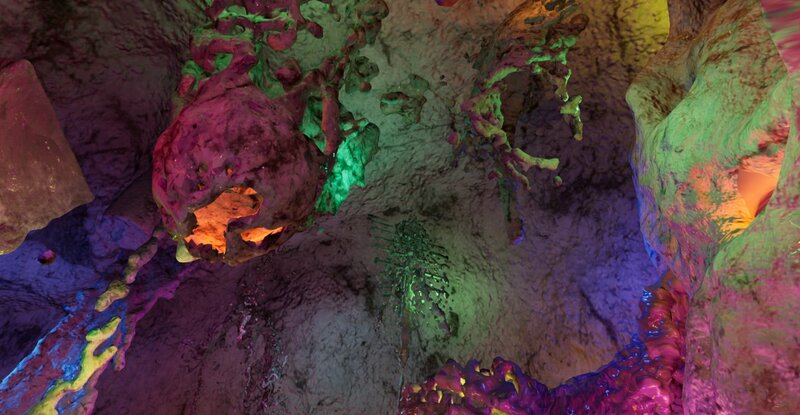 The spacial sound placed in the digital cave echoes in between the nature like sounds in the cave as well as the hypothetical machine’s operating noises. The experience in the digital cave also attempt to embody the concept of the Plato’s cave in the medium of virtually contracted realm, providing a contemplative environment for the visitor to wonder: walking, and teleporting within the control of the wireframed virtual hands that are given to them inside of the Karst caves. 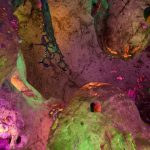 Continue to her digital art practice, Fu creates virtual reality piece exploring the idea of the techno sublime, relating to Chinese and Western landscape paintings, as well as the technological culture changing the way humans live in the contemporary technological culture. 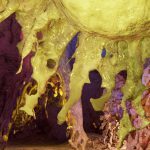 Snow Yunxue Fu is a Chinese-born and Chicago-based artist exploring the aesthetic concept of the sublime through a wide range of digital media. Fu has exhibited her work nationally and internationally, including Thoma Foundation Art House in Santa Fe; Venice Architectural Biennial; Current Museum of Art in New York; Hong Kong Arts Center, HK; ISEA 2016, HK; Expo Chicago, US; Digital Culture Center, MX; Kunsthalle Detroit Museum of Contemporary Art, US; NURTUREart Gallery, US; Gallery C Space, CN; West Village Art Gallery, CN; SIMULTAN Festival, RO; 9:16 Film Festival, AU; Spaces Gallery, Cleveland OH; Gene Siskel Film Center, Chicago IL; Supernova Digital Animation Festival, Detroit CO; International Mykonos Multimudia Festival, SOPERNOVA Digital Animation Festival, Denver CO; Greece; Galerie Protégé, NY, and etc. She has presented her work and research in institutions, symposiums, and conferences internationally, and has given artist talks at the Elmhurst Art Museum, US; Chicago Artist Coalition, US; Lido Art Center, CN; Guizhou Minzu (Nationalities) University in Guiyang, CN; Celebrating Women in New Media Symposium at SAIC, US; Trans-National Identity Symposium, US; and Ox-bow School of Art and Artist’s Residency, MI, US. Her early painting work, Kissing the Mother, is in the permanent collection of the National Museum of China in 1994, keeping the record of one of the youngest artists in the collection. Fu teaches mainly at the School of the Art Institute of Chicago (SAIC) in the Film, Video, New Media, and Animation Department, the Continuing Studies Department, and the Ox-bow School of Art and Artist Residency.